You are a homeowner in Toronto (or within the GTA) and have decided to have your house, loft, condo or apartment repainted. Great! Now which interior painting company do you call? Choosing an interior painter should be based on a checklist if qualifications. Understand, like most things you buy, that you get what you pay for. If you’re going to hire a painting contractor in the local classifieds, as inexpensive and talented as she or she may be, you should be looking at more that saving a couple of bucks in the least amount of time. Here are a few things to consider when selecting a painting company to redecorate your home’s walls, ceilings and baseboards. Reviews: Sites like Homestars allow customers to leave honest feedback about the interior painting contractors they hire. Be mindful that reviews are sometimes tainted by competing companies, or passive-aggressive customers. It’s hard to take a negative comment seriously when it is surrounded by praise. Take the common theme from all the reviews you read about a business, in order to judge their quality of service. Particulars: Sites like Homestars also showcase a company’s insurance and warranty specifics. The same information should be found on the interior painting company’s website. If the painters do not publicly show this information, you are better off trusting someone who does. Warranties: Does the company offer a guarantee on selected services? That’s a good sign. A company’s longevity is only as good as its reputation, since any reputation is built on the satisfaction of its customers. A warranty of at least a year should protect the customer from any potential paint peeling or cracks. If the company is willing to fix any issues after the job is over, they are a company you can trust. Be mindful, however, that interior painting companies can not perform miracles – if a workspace has not aged gracefully, a guarantee may not be offered in such problematic areas to paint or refinish. Ask about what guarantees the foremen cover. WSIB: What happens if an interior painter is injured on the job? It can happen, if ladders and scaffolds are involved. With proper certification from the Workers Safety Insurance Board, such potential accidents – and the finances that come with it – are the responsibility of the company you hire, not you, the homeowner. Insurance: There should be a minimum in liability, in case of any physical incidents suffered on the job. Damages to your property should also be covered. Your home’s redecorating process should be a worry-free project! Experience: How long has the interior painting company been in business? Several years show commitment. Several decades show trust. A business that’s been in the game for a long time in the Greater Toronto Area has endured all the challenges of a homeowner’s requests. They know how to take your vision out of your mind and onto your walls, because they have been doing it for many, many years. Photos: How can you hire a painting contractor without seeing photos of their work? Check out their website to see examples of what they can do. A painting company is only going to showcase their very best work to the public, so whatever you see is a reflection of how creative they can be. Proposal: If a painting company is willing to stand by their verbal promise, they will email you a letter that entails all they have told you. The email should contain most, if not all, of the features above, along with a breakdown of the scope of your interior painting project. Paint: Materials are one of the most important aspects of any interior painting project. The paint each contractor uses should be durable and with low VOCs (i.e. environmentally friendly). You should not have to worry about your pets or children breathing in any dangerous fumes after the job is done. 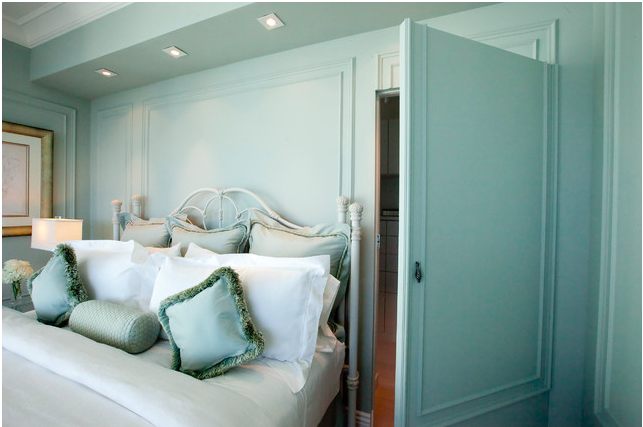 Ensure the painting company you hire uses a trusted brand of paint colours, like Benjamin Moore. If you have any questions about how Toronto’s Renaissance Painters works, based on the above, we are a phone call or email away. Use our webmail form to send us an email at www.renaissancepainters.ca, call us at (416) 618-0400 for more information.